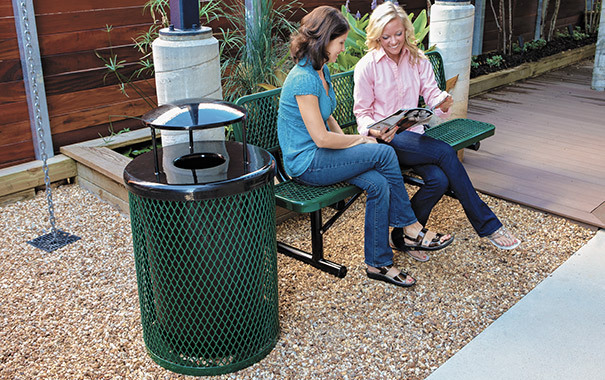 Rugged, sturdy expanded metal trash receptacle is a solid addition to promote litter-free environments. This 32 gallon steel receptacle is a popular choice for both indoor and outdoor commercial applications. 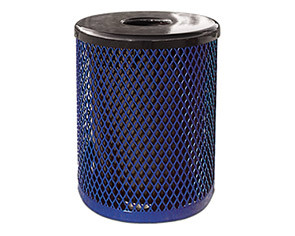 Constructed with 3/4" #9 steel and finished in an impact, UV stabilized thermoplastic finish this trash receptacle is able to withstand the rigors of high traffic use. Engineered to meet just about any site application demand, the receptacle base can be outfitted with several options; five lid styles, rigid plastic liners, in-ground and surface mounting kits.